One of our biggest requests has been the ability to export data from our database to use in other software for further analysis. Fortunately, WellDatabase handles this in a very simple way. Below is a quick guide on how to export data from WellDatabase. *A premium level subscription or higher is required to export data. Our first step is to filter data down to get the dataset you are after. For our example, we will search all of the Yates wells in Andrews County, Texas. To make things easy, here is a link to the saved search. Currently we limit the number of wells for export to 10,000, so we will need to filter our results down to below that number. The limit is solely for performance reasons as the export is created instantly. We will be adding the ability to export larger datasets in the near future, but it will be a process that the user will be able to request and then be notified when the export is ready. More on that later though. Now we’ll jump over to the Table View to see the list of wells. The Table View button is at the top right of the map between Map View and Analytics. 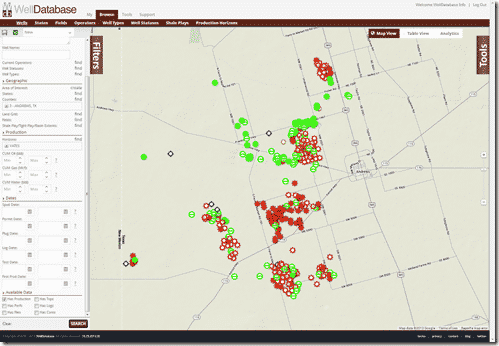 The table view shows that we have 422 wells returned for this particular search. We are under the 10,000 limit, so we c an now export. 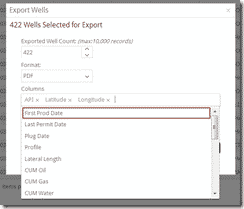 For this example we will be exporting the entire dataset, but you can also select individual wells to export by simply clicking the checkbox next to the wells you are interested in and then clicking the Export Wells button. 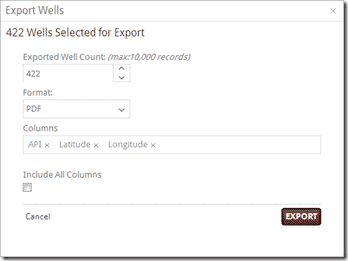 Again, we are exporting the entire dataset, so we will just go straight to clicking the Export Wells button without selecting any wells. This brings up the Export Wells screen where we have our export options. We can quickly see the confirmation of the number of wells we were expecting to be exported. The format defaults to PDF, but Excel, CSV, and Shape File are also available. Below that we have the column list. 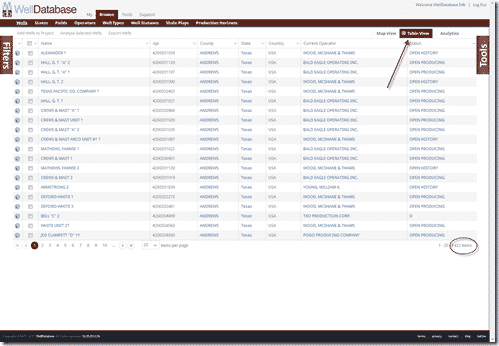 The columns to export defaults to API, Latitude, & Longitude, but users can easily add columns to the list by simply clicking in the column field and choosing the column you want from the dropdown. We have worked to make WellDatabase a world class data management and analysis tool, but there will always be situations where it is necessary to export the data into separate systems for a variety of reasons. At WellDatabase, we are more than happy to empower our customers with the ability to export the data to use how they see fit. Larger dataset exports coming soon. If you’re not already a WellDatabase user, sign up here and start using the map today. As always, feel free to contact us at support@welldatabase.com with any questions or comments.